The 100 Club is a diversified group from a variety of backgrounds. Its many members have one thing in common: a love of their surroundings and a desire to actively enjoy them. The 100 Club was started in January of 1990. Couples whose age totaled 100 (hence the name) and singles over 50 were invited to become part of a group that would later become the 100 Club. The first year a group of about 20 skied together at Sunlight on Wednesdays and to this day the 100 Club meets at Sunlight every Wednesday during the ski season. The Club now also skis Snowmass regularly. On a powder day, members will be scattered from Vail to Aspen Mountain. Also in 1990 a few hikes were organized so that these new friends wouldn’t lose contact during the summer months. 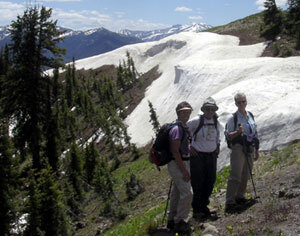 Today the Club plans and coordinates more than 50 hikes each year from April through October. People of all ages and abilities go on the hikes. It is not unusual for members to log 300 miles or more each summer. Through the years, some hikers have logged several thousand miles with the Club. The hikes range from relatively easy ones to some very challenging fourteeners. In addition to alpine skiing and hiking, the 100 Club now has groups for nordic skiing, snowshoeing, bicycling, tennis and bridge. The Club has monthly dinners that give members an opportunity to socialize and to meet new members. The Club dues of $15 a year include a monthly on-line newsletter.